If you have tried looking for a functional budget mouse for gaming in 2019, you most probably have realized that Logitech G203 and SteelSeries rival 110 are among the most competitive in their price category. But which gives the best value for your money? With an accurate sensor, a comfortable design, and limited but handy customization options, Rival 110 has everything you need in a gaming mouse. It is a six-button mouse with a polished look that makes it feel expensive than the $40 it costs. Even though this mouse lacks some DPI options available in a number of budget gaming mice, it boasts of a splendid DPI of 7,200, more than that of Logitech G203 Prodigy. Let’s look more under the hood to see how this mouse stacks up to other gaming mice for budget buyers. A good-looking mouse, the SteelSeries Rival 110 has a matte black top piece, and charcoal gray buttons and scroll wheel. The mouse’s side grips are textured and have a glossy black color. This mouse has some hump to it, and thus seems best for claw grips than palm grips. SteelSeries Rival 110 would have been an ambidextrous mouse were it not for the pair of buttons on its left. Its symmetrical shape features sculpted sides, which create natural, comfortable resting spots for thumbs and fingers. There is also a textured plastic on the side grips. The role of this is helping you maintain a firm grasp of the mouse. SteelSeries Rival 110 comes with 6 programmable buttons. These include the right and left mouse buttons, the clickable scroll wheel, one DPI settings button behind its scroll wheel. The left side of Rival 110 has one forward and another back button.Its side buttons are quite big and stick out a bit. However, do not worry about hitting them accidentally as they stay out of harm until needed. The scroll wheel of SteelSeries Rival 110is rubberized and has a textured feel that we wish was applied to its side grips too. This gives a good feel for scrolling, but its click is somewhat stiff. The other five buttons are not as stiff but give a great travel with a satisfying click. You will mouse about with the SteelSeries Rival 110 as soon as you plug it in. 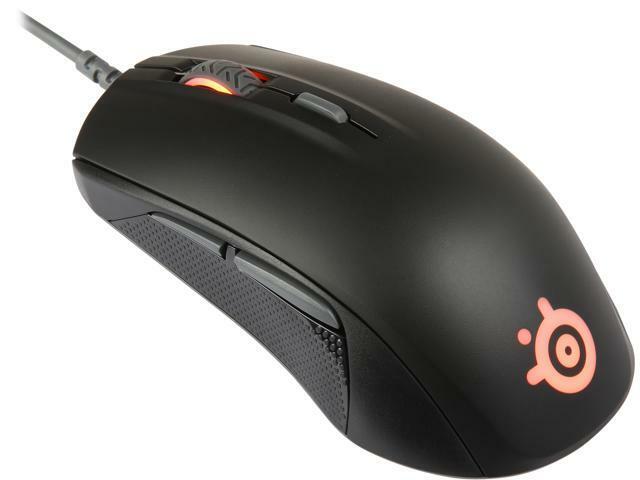 To customize the mouse though, you’ll have to install the Engine 3 software by SteelSeries. This software is easy to navigate, and most of its settings are laid out on one panel. Only lighting options are found on a different window. If you are a rebel, it is easy to reassign any of this mouse’s six buttons and what scrolls up or down. There are two buttons on the right that helps set DPI levels. While a number of budget mice allow you to set up to 5-6 DPI levels, SteelSeries provides only two. SteelSeries Rival 110 is a good gaming mouse that earns points for a comfortable design, accurate tracking, and a wide DPI range. It also offers a well designed and easy to use software that you can customize to suit your gaming needs. With its TrueMove 1 sensor, SteelSeries Rival 110 merges low latency with high precision accuracy. Like the Logitech G203, the mouse’s lightweight might deter competitive gamers who prefer heftier options. However, if you are a casual gamer, especially one on a low budget, SteelSeries Rival 110 will be a Steller deal for you at $39.99. The core construction of Logitech G203 is well made and comes with impeccable technical specifications for budget buyers. The looks of this mouse are quite misleading as it looks like a mouse you can use for regular office work. The design is simplistic and has been styled to be an ambidextrous mouse for both right and left-handed people. However, note that its thumb button is only meant for right-handers. Almost everything is cool about Logitech G203 Prodigy, but it has its downsides too. First, people with big hands might find it too small. It also lacks a braided cord and although it has been styled to be ambidextrous, it does not have thumb buttons for left-handed people. All in all, you will love the convenience that G203 Prodigy comes with despite the few hiccups you may experience. Its onboard memory for keeping game settings is a trendsetter, and you can own it at less than $30. To understand more features about this model, read our detailed Logitech g203 review.